I’m not a larophile*, but some of my favorite birders are. It’s hard to escape the mystic pull of wanting to excel at gull identification. Even more than warbler, shorebird, and sparrow identification, this is a field that tests our endurance (gull watching is too often done in bitter cold, windy conditions), patience (even getting one good photo can take hours as you try to separate the ‘interesting gull’ from the flock), observational skills (so many plumages! ), and expertise (one word–hybrids). Yet, when you can identify gulls with ease, you KNOW you’re a birder. And, for all our complaints about brown and gray plumages, gulls can be beautiful birds (well, some more beautiful than others, and Heermann’s Gull is one of my favorites, with one N at the end or two). In a birding world that celebrates identification, there are surprisingly few articles and books on gull identification. 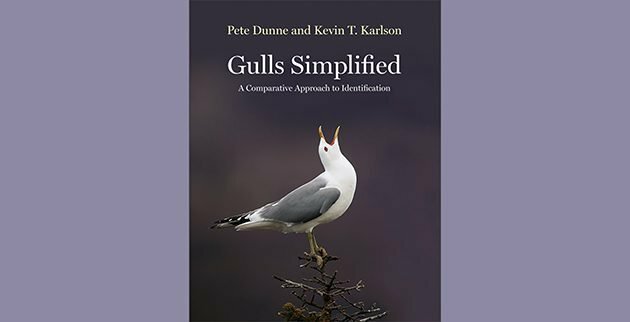 ** So, we need to lift a glass to 2018, a year that has given us Gulls of the World: A Photographic Field Guide by Klaus Malling Olsen and Gulls Simplified: A Comparative Approach to Identification by Pete Dunne and Kevin T. Karlson. There’s been a lot of excitement about this book. Pete Dunne and Kevin Karlson are two of the most prolific and well-known authors in the birding community. Pete Dunne has written and co-written 21 books (by my count, Wikipedia needs to update its entry!) on hawk identification, bird identification, and his musings on the natural world (most notably The Feather Quest). Kevin Karlson is co-author of The Shorebird Guide, Birding by Impression, and The Birds of New Jersey. This is their second co-authored book. Dunne is also known for his 37-year stint as director of the Cape May Bird Observatory and his 15,000 hours of accumulated hawkwatch time; Karlson is simply one of our best (and most approachable in the field) bird photographers. Both authors are experienced workshop educators at CMBO and birding festivals around the country. So, the bar here is high, there are expectations of excellent writing, high-quality photographs, a friendly yet educational approach, and a high level of expertise (which is interesting since both authors acknowledge in the Introduction that they are not gull experts). And, yes, they succeed on all points, though, as usual, I have comments. The cover is elegant–a calling Mew Gull atop bare branches against a dark background. Its simplicity echoes the book’s title, full of promises that birders’ dreams are made of. The subtitle–A Comparative Approach to Identification–is the first clue that there is no magic gull key (or ring or pill). Dunne and Karlson are presenting an alternative system of gull identification, one that they believe is simpler than the traditional emphasis on cycles and plumages. Their co-authorship is an engaging partnership of the avian colloquial, Dunne’s stock in trade, and visual education, an approach at which Karlson excels. The basic premise is that observation of traits such as size, shape, structure, and behavior, the same traits Dunne writes about in his hawk books, could and should be used as the basic blocks of a ‘holistic’ identification process. The hope and claim is that transferring this process to gull identification works more easily and just as accurately (at least for species) as an examination of plumage and molt patterns. The process doesn’t totally ignore plumage. Plumage patterns “augment” the identification process, but they don’t drive it. You could say that the right-brain, the part of the brain that is intuitive and creative, goes first, and the left-brain, where the logic resides, comes in second to refine and substantiate the initial impression. This isn’t a new idea. Steve N. G. Howell and Jon Dunn list “overall size and structure” as the fundamental first step in gull identification in their classic Gulls of the Americas (though they then go on to describe endless variations of plumage patterns). Jessie Barry writes that “with practice, experts can identify nearly all gulls by size and shape alone” in her 2010 article for the Cornell Lab of Ornithology. And, Karlson himself has a section on gulls in his 2015 book (co-authored with Dale Rosselet) Birding by Impression. But, nowhere else is this approach applied to gulls with such comprehension and insouciance. Dunne not only sweeps aside larophiles’ focus on plumage as a symptom of an obsession with rarities, he rejects the cycle system employed by Howell and Dunn. Instead, plumages are merged into the three broad age classes–immature, subadult, and adult–the same age designation Dunne uses for raptors. Geographical probability is also an important part of the process. The approach assumes that you are looking at the gulls most likely to be found in your specific area, not that you will find something different. 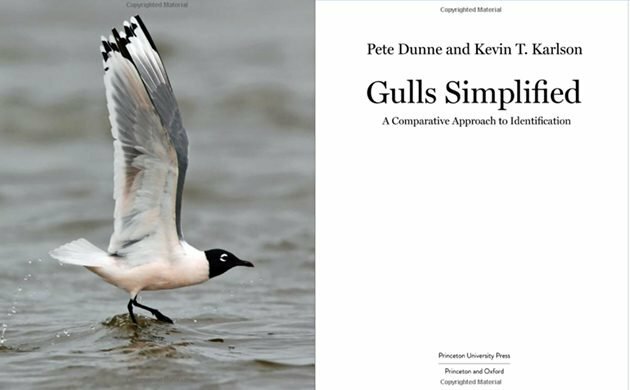 Dunne and Karlson explain all this in the Introduction, which consists of two parts–an Overview authored by Dunne alone, and a discussion of Traditional Gull ID Problems by Dunne and Karlson. Photographs with extensive captions are interspersed, each one nicely labeled as Intro 1, Intro 2, etc. Though some of the photo sets illustrate points being made in the text, others functioned to interrupt the narrative flow. 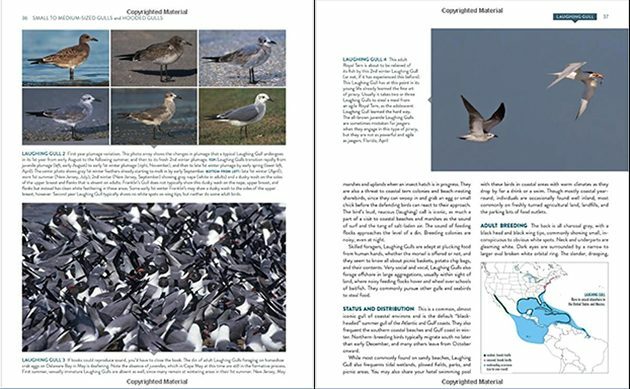 Three helpful sections precede the Introduction: Photo and silhouette comparisons of gulls that breed in North America (see illustration above), Basic Anatomical Terms illustrated with four diagrams, and a very selective Glossary. I particularly like the nutshell image and silhouette pages, the latter reminiscent of The Shorebird Book. The page numbers of each species’ species account section next to its nutshell photo would have been a nice addition, but I’m happy with these reference aids, medleys of horizontal and vertical shapes in crisp shades of white, gray, and black with touches of yellow. They’re a useful introduction to the idea that gulls’ shapes are indeed distinct. 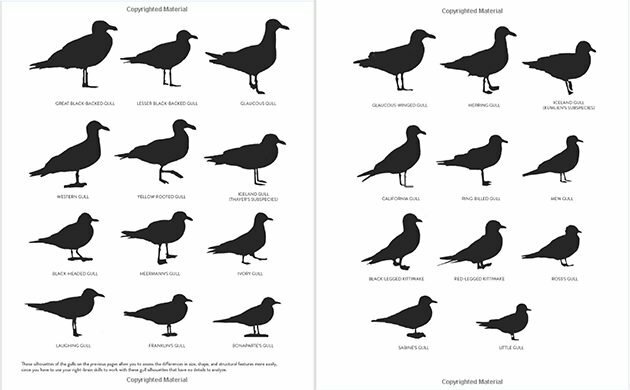 Gulls Simplified covers 25 species. Twenty are gulls likely to be seen in North America; these are divided into three chapters: (1) Small to Medium-sized Gulls and Hooded Gulls, (2) Gray-backed White-headed Gulls, and (3) Large Dark-backed Gulls. Five species are grouped in a chapter titled (4) Dark Horse Gulls (Rare or Unlikely Gulls). And, then there is a Hybrid Gulls chapter, covering five well-documented hybrids. The beginning of each chapter begins with a stunning, full-page photograph of a gull on the left; each photo shows the gull with wings raised, facing right as if in expectation of wonderful things. 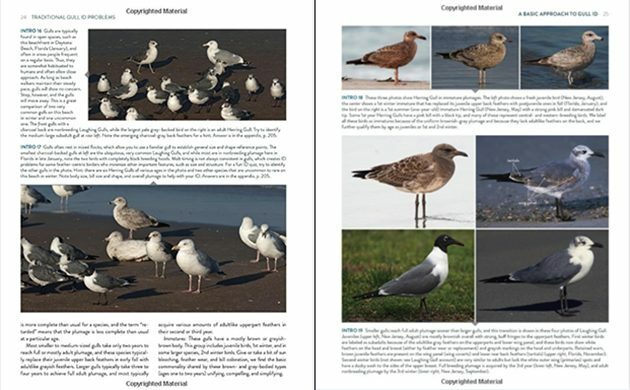 (The Hybrids page is an exception, featuring an image of a Little Gull with a flock of Bonaparte’s Gulls.) The right page is headed with a broad dark box highlighting chapter title and the common names of the gulls covered in the chapter. Several, but not all of the chapter headings also contain text expanding on shared characteristics. The text proper is divided into these sections: Profile, the must-read section; Status and Distribution, complete with range map; two to five sections describe plumage and other anatomical identification features, divided into age groups. These vary according to species. So, Laughing Gull is described in its Adult Breeding, Adult Nonbreeding, Immature, and Subadult forms; Western Gull is described in its Adult, Immature, and Subadult forms. Herring Gull, cited as “one of the more confusing gulls in the world” (p. 85), is described in five difference forms plus a note that there are also hybrid possibilities (this is very different from the description in Pete Dunne’s Essential Field Guide Companion (2006), where Dunne concludes that “there are only two plumages to deal with–immature and adult” (p. 263). 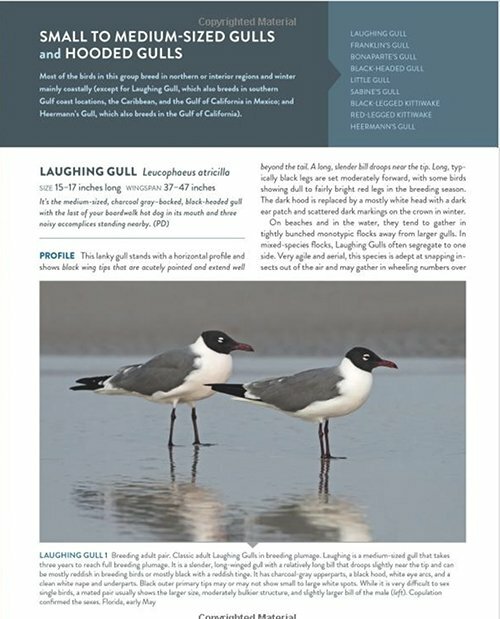 The section also extensively covers behavior–flight style, how the gull sits on the water, whether the gull flocks with its own kind or with other birds, how the gull feeds. This is the kind of information I love to learn and use in the field. There is extensive behavioral descriptions for familiar gulls like Laughing, Ring-billed, and Herring, but far less information on less common species like Iceland Gull, whose profile mainly consists of the differences between the Kumlien and Thayer’s subspecies. The range maps are from Howell and Dunn’s Gulls of the Americas and cover all of North America, including Mexico and Central America. In an interview on BirdCallsRadio, Dunne and Karlson state that the maps, which date from 2007, have not been updated (though they are smaller and I noted some differences in the color codes), but that changes in range over the past 11 years are not great enough to make a difference. I don’t know. 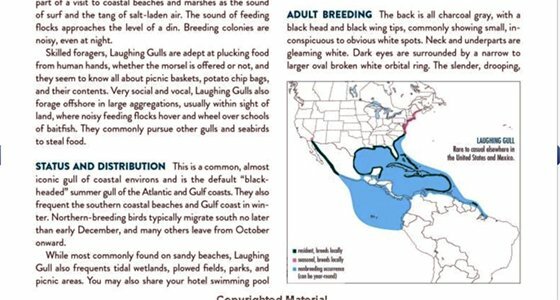 I compared the maps to those in the National Geographic Field Guide to the Birds of North America, 7th edition (2017) and though, yes, most of the ranges remain the same, there are some changes. Lesser Black-backed Gull numbers are increasing in Florida, the mid-Atlantic, and the West; Heermann’s Gull has been found casually in inland California and the Southwest. I’m sure there are other changes. If you are going to state that geographic probability is an important element in gull identification, then I think it is important to have up-to-date range maps, or, at the very least, articulate the dates the maps were developed in the introduction to the Species Accounts rather than the small print Acknowledgements. There are no distribution maps for most of the Dark Horse Gulls, with the exception of Ivory gull, and though the text gives breeding or typical vagrancy range, there is little information on lower-48 sightings (the Ross’s Gull status and distribution section begins with the comment, “You should be so lucky”). It would have been useful to refer users to eBird, where one can easily look up these records. Photo sets illustrate and expand on the text information. Some of the sets consist of photos illustrating the range of plumages for an age group, like the ones above; some are single photos depicting representative, comparative, or unique plumages, like those below. Extensive captions detail each bird’s plumage using plain language, no ‘remiges’ or ‘retrices.’ Arrows point out anatomical parts or identification features; group photos are labeled for species and age group. In other words, the images are used in the best possible way as educational tools. Karlson’s photos are sharp, clear, well composed, often exceptional, but it’s clear that each photo was selected because it illustrates a specific point (or several points) about identification of the subject species. Care has also been to arrange the photo sets so they balance each other and the main text. 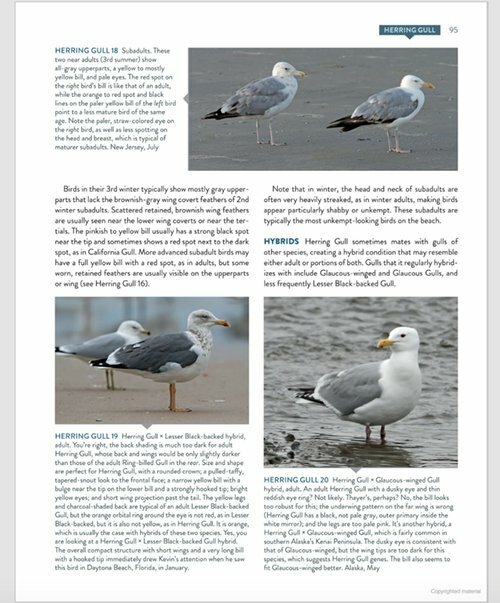 The top Herring Gull page, for examples, balances two horizontal photo series. 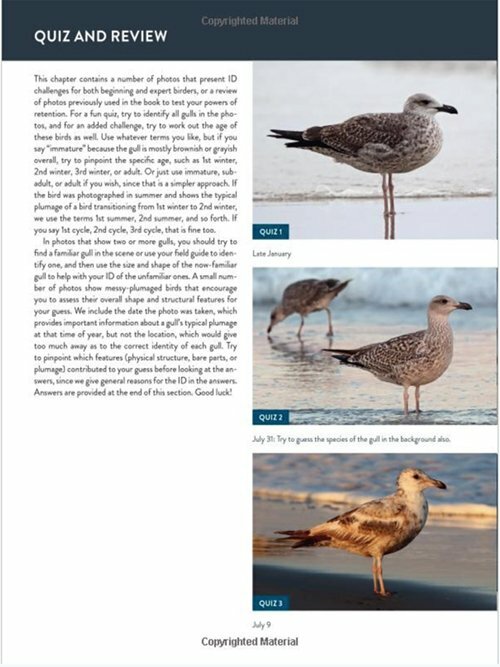 The second page, directly above, arranges three photo sets, text about Herring Gull 3rd winter birds, and text about hybrids in such a way that each part is narratively readable. Not an easy design feat! Overall, the graphic design of Gulls Simplified is exceptional. I’ve already talked about how each chapter begins with a beautiful photograph. Headings on the left and right pages identify chapter and species, so when you open the book at random you always know where you are. Font size and color are used to differentiate photo captions from narrative text. Deep colors are balanced by white margins. These elements are very important when dealing with a high-content subject like gull identification. It’s very easy to be overwhelmed by all the detail. The graphic organization and design helps our brain sort it all out, decide what we want to read and when, and enables us to take mental breaks to simply enjoy the beauty of the images. In The Shorebird Guide tradition, Gulls Simplified uses quizzes to both prompt us to study harder and to reinforce the information in the species accounts (the authors say it’s mostly the latter, but don’t underestimate the competitive spirit of wanna-be larophiles). There are actually two types of quizzes–those in the formal Quiz and Review in the back of the book, and quizzes scattered through the Introduction and some of the species accounts, whose answers are given in a separate back-of-the-book section. The quiz photos are tough. I would normally not attempt to identify these gulls till I had read this book again, but in the interest of good reviewing I peeked at the answers. They are great; the answers thoroughly go through the steps for each identification in terms of shape, size, structure, bringing in possibilities of sun bleaching and leucistism. And, interestingly, few of these answers utilize esoteric plumage features, and when they do, it’s to narrow down or confirm an identification already worked out using the more holistic criteria. In other words, Dunne and Karlson show that their system works. Thirty-five times. The Bibliography is extremely brief, citing five books (two used as sources for the maps and measurements, three cited as sources for further information on hybrids, one by a co-author) and one government article (a North Dakota article on Franklin’s Gull). I think the authors could have done better; there is a lot of blank space there. Photographer credits list the 19 photographers whose photos (a little over 80 according to my count) supplement Karlson’s. 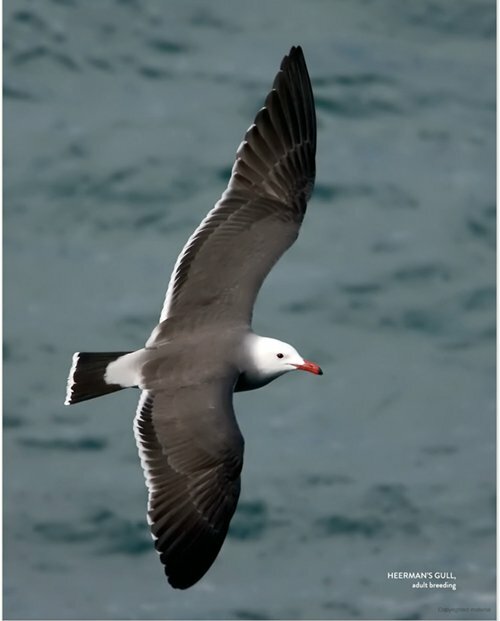 The Index, like the Bibliography, offers minimal information, listing common and scientific names of gulls and major subspecies in the Species Accounts, but no hybrids and no concepts. Gulls Simplified is an interesting book. 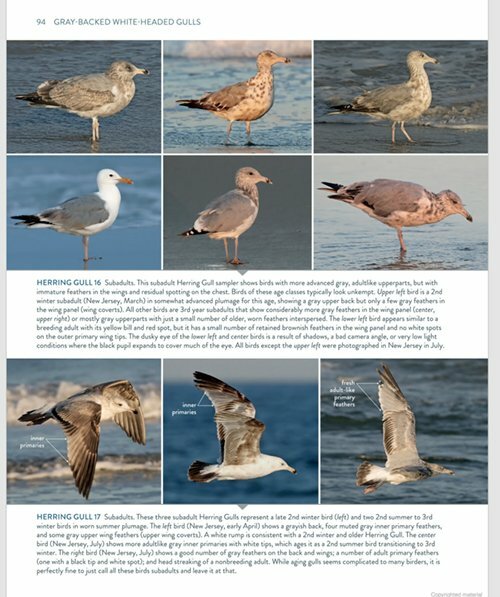 This ‘holistic’ approach to gull identification is probably heresy to the larophiles who hang out at their local landfills or who participate in the Gull Frolic in Chicago in February or who discuss identification on the North American Gulls Facebook group (over 8,000 members). But, I think the birding world is big enough to accommodate more than one way to identify the members of this infamous family. Gulls Simplified is an excellent guide for intermediate birders and has enough depth to be of interest to advanced birders too. It may be intimidating to beginning birders, even with its “simplified” approach. But then again, when it comes to gulls, many of us are beginning birders. I had the pleasure of talking to Nate Swick of the American Birding Association once again about the best birding books of the year. We talk about Gulls Simplified, Birds of Central America: Belize, Guatemala, Honduras, El Salvador, Nicaragua, Costa Rica, and Panama, The Feather Thief, and some books I have not had a chance to review yet, like Daniel Lewis’s Belonging on an Island: Birds, Extinction, and Evolution in Hawai‘i and Birds of Nicaragua: A Field Guide. I hope you’ll listen in on our conversation, lots of good gift ideas here, for friends and yourself! * A larophile is a gull enthusiast, taken from the genus name Larus and/or the family name Laridae. Birders who shrug their shoulders and refuse to have any part of gull discussions are, of course, larophobes. ** To be fair, 10,000 Birds has published a number of articles about gulls, including Jochen’s mini-series on Europe’s large white-headed gulls, Clare’s celebration of Broome’s Silver Gulls, and Corey’s taxonomic musings on the Kumlien’s Gull. But, these are not hard-core identification articles. Paperback, 208 pp., 7 1/2 x 9 1/2, 330 color illus. The Little Big Year – Week 42: Tucson’s Sweetwater Wetlands. Where Are You Birding This First Weekend of August 2017?